I have made many pickled cucumber recipes with different types of cucumbers. This refrigerator version is the one our family loves. Not only are the cucumber pickles beautiful, but they hold up well in the refrigerator for a long time. 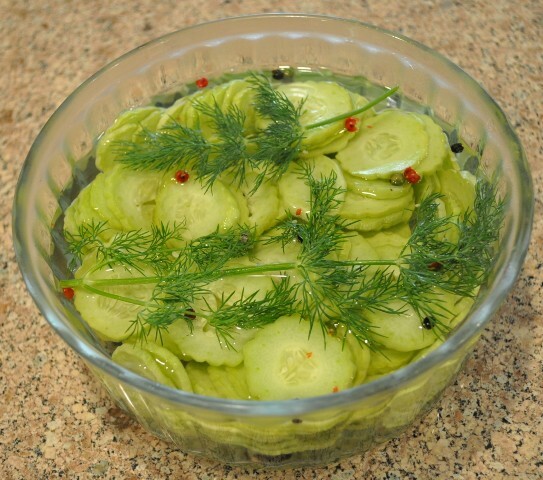 The Pickled Armenian Cucumers with Fresh Dill stay crisp and they get better tasting every day. This is one of those easy-to-make recipe that you will make over and over. This delicious Pickled Armenian Cucumers with Fresh Dill recipe, comments, and photos were shared with me by Karen Calanchini, Food Stylist and Photographer, of Redding, CA. More delicious Pickle Recipes for great cooking ideas. * The Armenian Cucumber is a long, slender fruit which tastes like a mild cucumber, looks somewhat like a cucumber inside, but is actually a variety of muskmelon that is a species closely related to the cucumber. 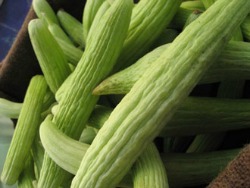 Also known as the Yard-Long Cucumber, Snake Cucumber, Snake Melon, and Uri. It is thin-skinned, slightly sweet and mild-flavored, with soft seeds. Like the English cucumber, it does not need to be peeled or seeded. ** All black peppercorns may be used if that is what you have in your kitchen. Rinse cucumbers, and use a mandolin to slice them into thin slices. Place into a large glass bowl and set aside. In a medium-size pan, combine vinegar, water, sugar, and peppercorns. Heat over medium heat and stir until sugar is just dissolved(do not allow to boil). Remove from heat and set aside to cool. When mixture has cooled, add to the sliced cucumbers and gently mix together. Place the dill springs on top, and cover. Place in refrigerator for at least three hours prior to serving. I like to marinade them at least one day ahead.